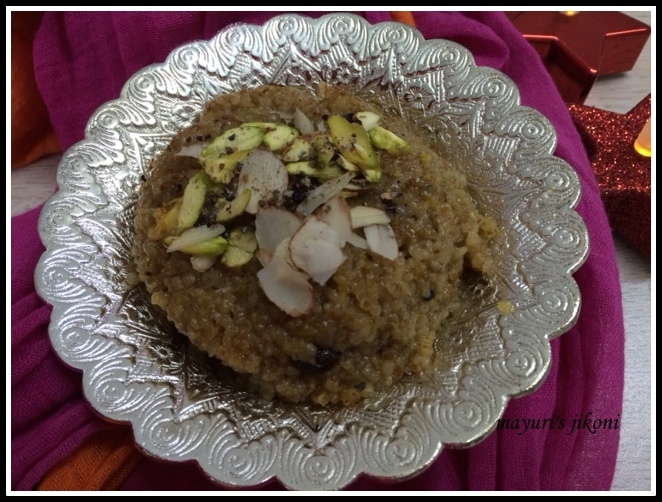 Lapsi is a Gujarati sweet dish usually made to celebrate an important event or festival. Its made from cracked wheat, ghee, water, sugar or jaggery and flavoured with spices like cardamom, saffron and nutmeg. Our nephew Vishal is getting married this year, so what better occasion to make lapsi. Today, the official agreement for marriage was announced so I made it to celebrate the happy occasion. Any excuse to make lapsi as I love it and its actually very easy to make. I always make lapsi on Dhanteras day to begin the Diwali celebrations. I prefer to use the cracked wheat with husk and not the white one. Most Indian stores will sell it as lapsi, fada lapsi or dalia. Some people make it with milk but I prefer the one with water. You can cook it in a pressure cooker to reduce the cooking time, but it tastes different. Its best to let it simmer in the water till it is evaporated. The main spice used is cardamom. You can add spices that your family may prefer. Heat ghee in a pan. Add the cracked wheat and roast it over low heat till it turns golden brown. Keep mixing it all the time. Add the hot water and let it cook over low flame till nearly all the water gets evaporated. Stir occasionally. Add sugar, raisins and almond pieces and cook till all the water gets evaporated and the lapsi begins to leave the sides of the pan when stirred. Take it off the heat. Add the cardamom powder and saffron. Garnish with almond and pistachio slivers and serve hot. If you cook it ahead, the mixture may become stiff. To reheat it just sprinkle a bit of water before heating. I like my lapsi on the sweet side. You can add ½ cup sugar and try it before adding more sugar. The texture of the lapsi will depend on how coarse or fine the cracked wheat is. I think it is great when traditions for special cultural foods are kept alive. Mmmm, yum! I just love anything with cardamom in it.